They are the refugees that aren’t featured in music videos or fund-raising concerts. Although China has occupied Tibet for nearly fifty years, there is still steady stream of Tibetan refugees, braving the elements and Chinese border patrols to seek asylum in India. Those border guards will fire at will, as they did in September 2006, when they gunned down a seventeen-year-old nun. That incident was the seed that eventually germinated in the second narrative feature from the filmmaker tandem responsible for Dancing at Lhasa. 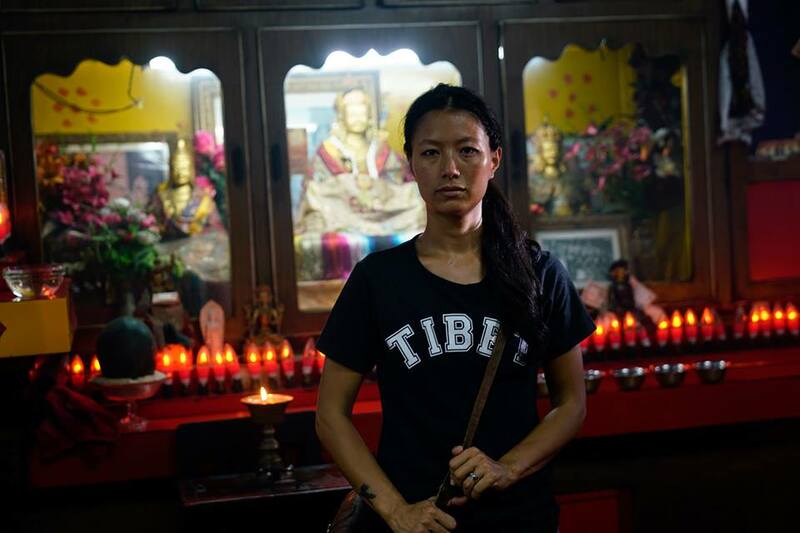 Survivor’s guilt remains a potent force in Dolkar’s life, but even when they reach Northern India, Tibetan refugees like her are not safe from Chinese moles and spies in Ritu Sarin & Tenzing Sonam’s The Sweet Requiem, which screens during the 2018 Toronto International Film Festival. With the Chinese encroaching on their traditional nomadic grasslands, Dolkar’s father decided he had to take her to India if she was to have any sort of future. She survived the trip, but he did not. Technically, he was shot by the Chinese, but she blames Gompo, the guide who abandoned their traveling party. Twenty years later (give or take), she is a poor but independent woman living in India. She is popular with the Tibetan expat community, but she has not seen her mother and sister since she left. It is a relatively simple life, but it is upended by the arrival of a supposed Tibetan activist, who happens to be a dead ringer for Gompo. Dolkar starts following Dolkar out of anger and suspicion. As a result, she will witness the visit he receives from two thuggish agents of the Mainland government. However, there will be more to the story of the man who is probably Gompo than she realizes. Sweet Requiem is one of the rare films that works equally well as a thriller, a tragedy, and an advocacy film. An enormous amount of credit goes to Tenzin Dolker, who is absolutely extraordinary as Dolkar. She lights up the screen, but she is also arrestingly vulnerable and messily complicated, in an acutely human kind of way. Veteran Tibetan actor Jampa Kalsang Tamang is really just as haunting as Gompo in flashbacks and the guilt-wracked shell of a man Dolker intends to confront. It is not a flashy performance, but it connects on a gut level. Shavo Dorjee also helps keep the film grounded in reality as his namesake, a Tibetan refugee activist, who carries a torch for Dolkar. Sweet Requiem is a story of human tragedy and suffering that incorporates some weighty Buddhist themes, but it also provides a wake-up call regarding China’s harassment of dissidents abroad. Clearly, the two spies (played chillingly by actors credited as Lhakpa Tsering) believe they can operate with impunity in India, because it is obviously true. Sarin & Sonam (the son of Tibetan refugees) also use the heartbreaking cases of Tibetan self-immolations to underscore the atmosphere of desperation, but they remain scrupulously sensitive (and never exploitative) in the way they address the phenomenon. Ultimately, the cumulative impact is deeply moving. Very highly recommended, The Sweet Requiem screens again tomorrow (9/11) and Saturday (9/15), as part of this year’s TIFF.